I never thought Jake would be that much of a jerk. This episode is by far the creepiest one I've seen. I think that jerkiness was a lil' bit of Jay T. Doggzone coming out. I thought this episode was great. It felt like it was poking fun at all the dumb libertarian-esque stuff that comes out of Silicon Valley these days. Money turned them into jerks, Finn realized the error of their ways, and they learned a little lesson by the end. I think the fact that the characters are all capable of swinging to both sides of the line of cool/not cool is a strength of the show, because generally when they go not cool, it's made obvious that, well, it's not cool! It's also true to the show that a character becomes obsessed with something they're enjoying, detrimentally so. Just think of Finn in the dungeon train. 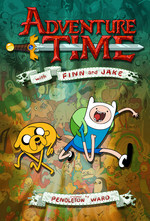 I enjoyed it, as it was a nice return to the normal world of Ooo, after the psychedelic visit to the Food Chain museum. Yowza! Had to appreciate the upper middle class berry citizens. The irony that the bribeable guard ends up as the one ironically covered in molten gold - his dereliction of duty was nearly as heinous as Jake's pursuit of free market entertainment. It was also rather sad when Finn tried to hand the berry couple bags of coins in apology and their initial reaction was to start trying to eat them. Indicative of economic conditioning of the have nots? NEPTR being forced to be the sheriff by BMO drawing evil goatee and mustache on him? Awesome. In a way, BMO also showing how BMO could be a jerk. I also liked how it visited the problem of adventurers getting so much treasure that it becomes meaningless, which happened in two longrunnning D&D campaigns in my youth. I never thought Jake would be that much of a jerk. The Card Wars episode is a strong contender for Jake jerkiness. I really liked this episode. I had to pause it to get something right on the scene where jake and finn meet up in the alley. I gave my partner a brief synopsis of the events so far. It was a high point of my evening. also: "I was aiming for the rope" or whatever BMO says - PRICELESS! Haha, you should have seen the Morrowind playthrough me and my brother did when that first came out, I guess 200+ hours of hording loot in our house. Economics stopped meaning anything very quickly. Also, I really enjoyed that episode. Good to see bemo involved again, it feels like she's been missing for a while. Also, it's interesting bemo and neptr are playing together now, after he said 'no neptr, I am not like you' when neptr suggested hanging out a while ago.